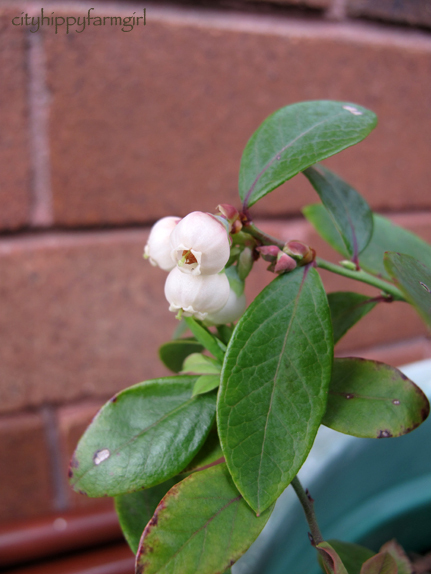 This entry was posted in Connecting with Community, Food Glorious Food, Going Green, Making, Creating + Frugal Living and tagged blueberries, chilli, city living, green, green living, pot plants, rosemary, small gardens, sustainable, urban living by cityhippyfarmgirl. Bookmark the permalink. I’ll be interested to which ones you get too Celia. It seems half of my chilli are big and the other the little ones. Haven’t tried the big ones yet, but I can say the little ones are….HOT! Keri I’m sure you could easily have a blueberry plant in your space. They are pretty hardy, and I really don’t have the best position for growing things, and it’s still alive. Ha, our neighbours gave us some large pale green peppers, or so we thought. We threw them in a favourite pasta dish and oh my goodness they were hot. Definitely chillis rather than peppers. We ended up adding cream etc to the dish to make it palatable. Oh, that does sound hot. 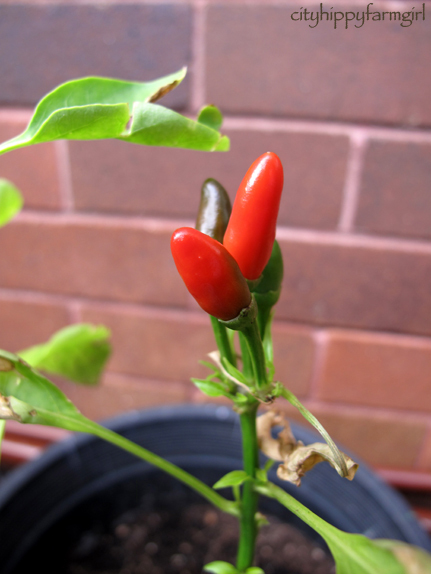 My son ate a chilli from a bush in my garden when he was very young. All I could do was sit him in a tub of cool water and pour water all over his face until the pain went away. He was asking me to put cream on his teeth, the poor little mite. He gave that bush a wide berth for a long time after that. Those things are hot! Debra, the poor little thing! I remember my little brother did a similar thing, although it was a neighbours kid who convinced him it would be a good idea to eat the chilli. Does your son remember it? Tried it last night and it’s HOT!…and I only licked it. Our rabbits and deer love to eat the jalapeno leaves, but stay away from the peppers and flowers…we now need to find a way to keep the plants healthy without leaves until the new leaves grow. Cheeky critters. At least they have enough sense to keep away from the peppers. 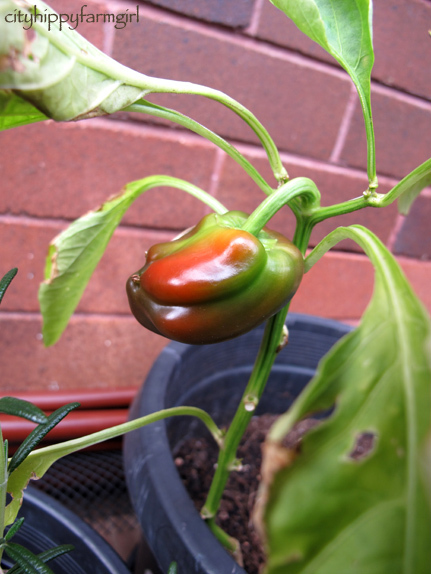 My jalapeño peppers aren’t ripening up yet, and now we’re running out of summer warmth and longer days of light. Happily, it’s not like 15-years ago here when you couldn’t find a good, hot pepper in the supermarket. Now you can find them even at the corner shop. I heard recently that it’s not the seeds that are hot but the membrane, and if you remove that film even the hottest pepper is edible. Have you heard that? Yep, that’s what I believe too Misk, it’s the membrane that is the hot part. If you want to lessen the heat just put a small portion of the membrane in. They look HOT to me- how do they smell? Sometimes you can smell the heat- your nostrils quivering from the very contact of their aroma! My nephew is from Texas- and once he braggingly ate a pepper he had erroneously identified as a jalapeno right off the plant. It wasn’t- some blisteringly hot variety, instead- and his face turned bright red- we gave him bread, butter and milk and still he was in agony. Be careful around those hot peppers! I know what you mean about the smell Heidi, but these ones don’t have any of note, however they are HOT. I licked a tiny piece last night and had a numb tongue for 5 minutes. Your nephew- brave man! Ouch. Good luck with the chillis! You’re right, some Indian dishes take hot to a completely new level. Those look almost hot enough to me! Soooo, how hot was hot? 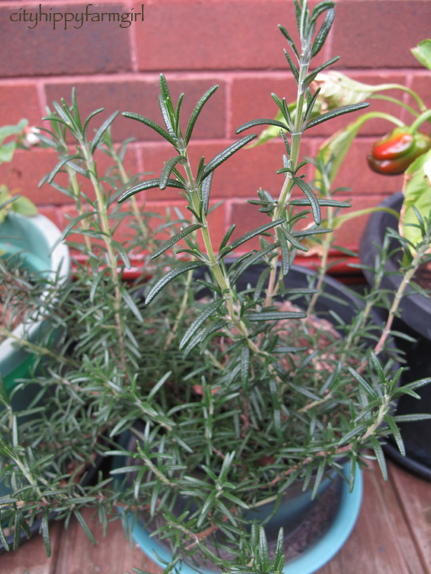 I love the hardiness of rosemary – ours gets no watering except when it rains and gets picked to within an inch of it’s life, yet still the little bugger soldiers on! It’s a hive of activity on your metre box – hope you get some blueberries!